The phase-out of ozone-depleting synthetic refrigerants in refrigeration systems becomes increasingly commonplace. Carbon dioxide, CO2, is one of the natural alternatives. 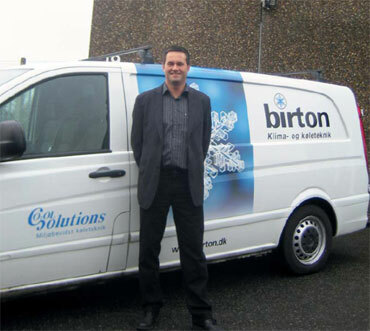 As early as the beginning of the 1990s, the Danish company Birton A/S saw the potential of carbon dioxide as a vital part of natural-refrigerant cooling systems. These systems are not only more lenient on the environment; they also significantly increase the efficiency of processes where they are used. Today, Birton’s sustainable refrigeration systems with natural refrigerants are produced and sold under the brand CO2OL Solutions. In 2004, Birton developed medium and high-temperature systems with up to 50 bar CO2 design pressure. This “pump-less” system uses no pump, compressor or other mechanical device. Instead, it consists of two vessels, heat exchangers and pipes – with no moving parts. The system can be used as an alternative to (or replacement for) central refrigeration and aircondition systems using direct expansion of synthetic refrigerants, or in chillers with water or brine systems. Typical applications are found both in commercial and industrial refrigeration. “Without pumps and compressors energy consumption is reduced and the risk of pump cavitations is eliminated. Furthermore, fewer components means minimal maintenance needs,” says Bent Johansen, CEO at Birton. Alfa Laval brazed plate heat exchangers offer superior heat transfer, extremely small footprint and cost efficient, reliable operation. Finding the right line of heat exchangers for the company’s advanced, patent-pending thermal pump system. Using Alfa Laval heat exchangers Birton could develop a "pumpless system", which has no pumps and compressors, and consumes less energy. As a world leader in their field, Alfa Laval give us top-quality products, good delivery times, and the technical expertise that we need to feel comfortable.